Ten years after the events of The False Prophet, where the Avatar had brokered a new but uneasy truce between Britannian and Gargoyle society, the scholar Sir Cabirus took an expedition into the Great Stygian Abyss to found a new town of virtue. Inspired by the Path of the Avatar, Sir Cabirus sought to establish a town of all eight Virtues in harmony, and out of a sense of poetic justice chose as the location for this center of virtue the Abyss, the blackest pit in all Britain, where the Stranger from Another World finished his trials and became Avatar. Cabirus’ colony failed – as all utopias eventually do. It was only his personal leadership and charisma that kept the colony together – when Sir Cabirus suffered an untimely death, the colony fell into thieving and squabbling, and quickly collapsed into ruin. The people of the Abyss have abandoned it or been lost forever in the depths, and Britannia’s great councils have sealed the entrance, leaving it to vicious beasts surviving from the Ages of Darkness. Only the surface town on the Isle of the Avatar survives, and they have a problem. 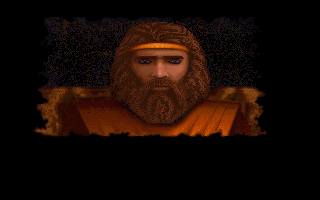 Baron Almric’s daughter Ariel has been kidnapped, and you, Avatar, have been found by his guards in her bedroom. 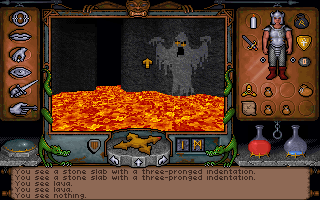 Your protestations of innocence are ignored, and you are sentenced to be thrown into the sealed Stygian Abyss, there to find Ariel and bring her back, or not come back at all. As for you, you’re sure something greater is going on than simple kidnapping. A ghostly apparition has drawn you from Earth, wailing about treachery and great evil about to be unleashed on Britannia. 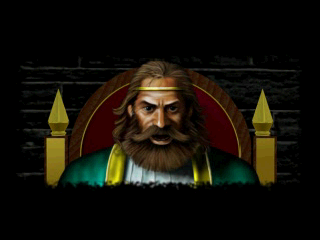 The true kidnapper has fled into the Abyss, and steeling yourself, you once again find yourself charged with being Britannia’s savior. Can’t get a break, can you, Avatar? 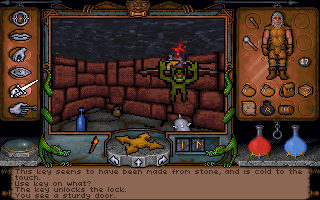 Developed by Blue Sky Productions (unrelated to BlueSky Software, a long-lived company famous for their Sega Genesis games Jurassic Park, World Series Baseball and Vectorman), Ultima Underworld is a first-person RPG, superficially similar to Wizardry, Dungeon Master or Might and Magic, but with a unique twist. 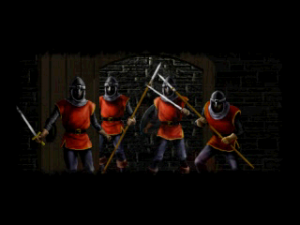 The game isn’t grid-based like those games, but true 3D, the first 3D role-playing game of its kind. While a technical marvel and a landmark programming achievement, the best and most notable feature of Ultima Underworld is the integration of simulation elements into the ancient Dungeon Crawler genre, putting game world interactivity and complexity at the forefront in fine Ultima tradition. 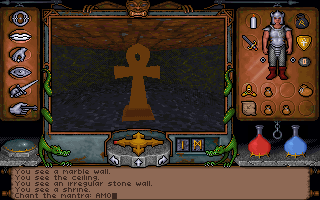 Ultima Underworld is a real masterpiece, prone to inspiring fits of cultish worship in critics and players alike. 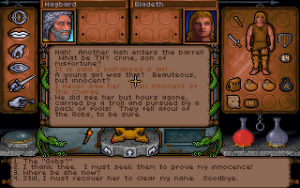 After starting the game, you’re prompted to create a character. Besides picking gender and your portrait, you also pick a class from one of the eight traditional Quest of the Avatar jobs (Bard, Tinker, Fighter, etc. ), and then pick some starting skill specialties from a list. 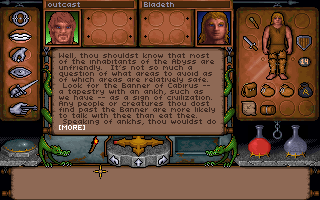 The game plays from the viewpoint of your character, and you interact with the world using the mouse, as in Ultima VI. Moving the mouse cursor around the viewport on your screen lets you pick a direction to move in. Interacting with the world is done by selecting different commands like attack (lets you swing your weapon) or look (gives you a description of what you click on) from a set of icon buttons on your screen. Equipping gear and items that you find in the Abyss is done by dragging and dropping them from your world view or inventory to a paperdoll display of your character, like the system later used in Ultima VII, and inventory capacity is limited by the weight of items. 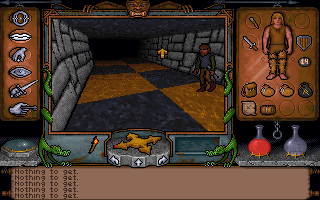 As Ultima Underworld was released before ASWD+mouselook became the de facto standard of controlling first-person games, controlling your Avatar takes a bit of getting used to, but feels comfortable once you’re over the learning hump (mouselook didn’t actually exist until Bungie Software’s Macintosh philosophical-shooter Marathon in 1994). Exploring the Abyss automatically fills in an auto-map, a luxury of a feature at a time when RPGs expected you to draw your own maps on graph paper; the UUW automap allows players to scribble notes down, a useful ability. Combat is real-time, and fighting monsters builds experience points, which increase hit points and mana and allow the player to use Mantras at scattered shrines to increase their proficiency in particular skills. The game’s skill system includes specialties in abilities like running, jumping, swimming, using swords or bows or other kinds of weapons, casting magic, and interacting with NPCs. 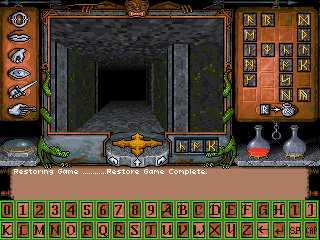 The game has a detailed magic system as do previous Ultima games, but rather than the reagent mixing system, spells in Ultima Underworld are selected by combining a set of runestones representing magic syllables. While the classic dungeon crawler represented by games like Rogue or Wizardry have only a bare glimmer of justification for your level-grinding and looting, the Stygian Abyss is a storied place with a detailed history that you’ll uncover as you delve into the depths. Traces of the failed society in the Abyss are everywhere, and artifacts and writings left behind tell the story of Sir Cabirus’ doomed experiment and the eventual downfall of the colony. 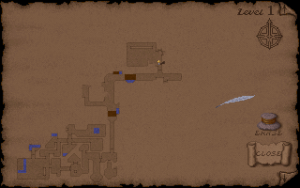 The Stygian Abyss has multiple biomes with different monstrous societies interacting, including lizardmen and trolls, and NPC interaction is fairly important to progressing in the game. Ultimately you’ll also discover the identity of the strange phantom who brought you to Britannia, and set right what once went wrong in just the nick of time in traditional heroic fashion. Far from a simple, repetitive and tedious hack-and-slash level-building dungeon crawler, Ultima Underworld is full of what Blue Sky Productions called simulation elements, an intense focus on a realistic and interactive world. You can run, swim and fly, learn to actually play musical instruments, fish in pools and rivers for edible fish. You can eat mushrooms, but like in real life, be careful which ones or you might get poisoned. 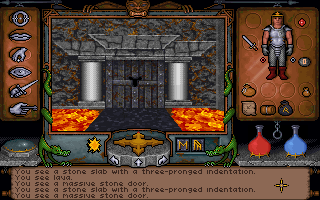 You can find a key for a locked door, or you can bash it in and watch it swing on the hinge, or blast it (and every other object and living creature) into oblivion with an end-of-the-world spell. Magic can occasionally conjure up a piece of corn on the cob, and if you use it with a torch, you get popcorn. You must eat and sleep to stay healthy, and your torch will burn out if you don’t extinguish it before laying down for a nap. Weapons deteriorate with use, particularly if you’re hacking away at a door with your sword, and they must be maintained or replaced. Rather than strict levels, the entire Stygian Abyss is open to you, and there’s a multitude of different paths and different ways to tackle it and complete your objectives; the game is decidedly nonlinear and sandboxy years before the term ‘sandbox’ came into use as a genre label. 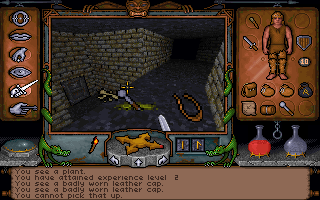 “Years before its time” is a good description for Ultima Underworld in general. While initial sales were lukewarm, word-of-mouth spread and eventually The Stygian Abyss sold half a million copies. 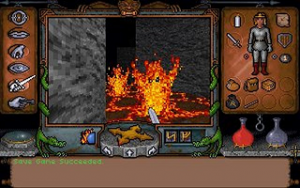 The game was a massive critical hit, with magazines like Computer Gaming World, PC Player and ACE practically drooling over it their gushing reviews and Dragon Magazine outright declaring that all previous ‘traditional’ dungeon-crawlers had been made obsolete. It is impossible to overstate the historical importance of the game: every true 3D RPG, from Might and Magic VI to Oblivion to World of Warcraft, as well as story-heavy action games like Deus Ex and Half-Life, owes to Ultima Underworld. 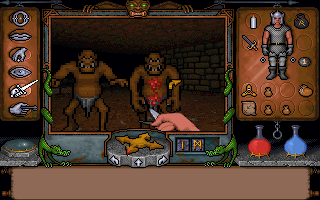 Ultima Underworld may not have sold as well as its better-known contemporaries Wolfenstein 3D or Doom, but the game’s engine was a technical marvel in 1992. Besides being the first true 3D first-person role playing game, it was the first 3D game to use texture-mapping on surfaces, had rounded walls, angled ceilings and curved boundaries, allowed ceilings with varying height, looking up and down, and other marvels of programming work. 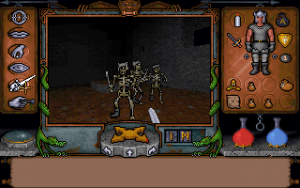 Ultima Underworld may not have been the very first first person 3D game (id Software’s Hovertank 3D and David Braben’s Elite came earlier, as did many others), but it was a direct influence on the games of id Software which popularized the genre. 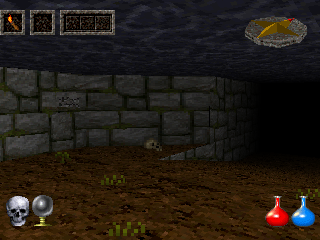 David Kushner in his book Masters of Doom relates a story about how the texture-mapping of Catacomb 3-D and the speedy world rendering of Wolfenstein 3D were inspired by a tech demo of Ultima Underworld that John Carmack, id Software’s lead programmer, had seen and decided to try to improve on. 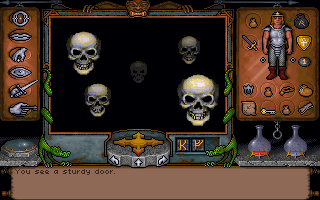 Along with Lucasarts’ Monkey Island 2, Ultima Underworld is the first computer game to use a dynamic music system, changing the music on the fly based on your actions. 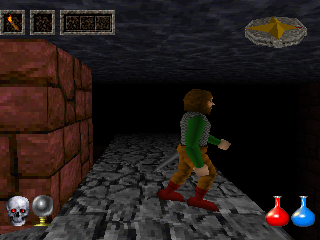 The original engine was intended to push the limits of lighting in 3D games as well, but the complicated lighting features were removed from the final build of the game, as they caused crippling slowness on current computer hardware. 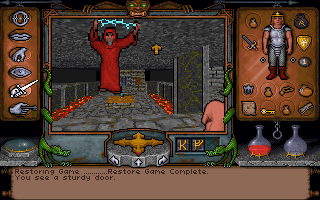 Ultima Underworld was a particularly heavy influence on developers such as Bethesda Softworks, who created their own take on the heavily open-ended first-person RPG two years later with The Elder Scrolls: Arena, and Bungie Studios, who incorporated a similar visual style and open-ended exploration and story elements into their Macintosh adventures Pathways into Darkness and Marathon. The Stygian Abyss was developed by a small team of former Origin employees who stayed in New England when the rest of the company moved to Texas. Calling themselves Blue Sky Productions, the team was composed primarily of MIT students and recent graduates, headed by designer Paul Neurath (who had designed Origin’s early space exploration game Space Rogue) and produced by Warren Spector (who had previously produced Worlds of Ultima: Martian Dreams and Wing Commander II). Neurath wrote the original design document for a game to be titled Underworld, which was intended to be a next-generation dungeon crawler building on the new ideas in FTL Game’s Dungeon Master, a widely-ported RPG which took the basic formula of Wizardry-style dungeon-crawling and made it happen in real-time with mouse rather than keyboard control and skill-building rather than level gaining. Completing the original group of three was MIT student Doug Church as programmer, and Origin concept artist Doug Wilke drawing reference art for the team. Development began in the summer of 1990, first on the Apple II and then later on the IBM PC due to the Apple II’s ancient hardware not being up to the demands the game was placing on it. 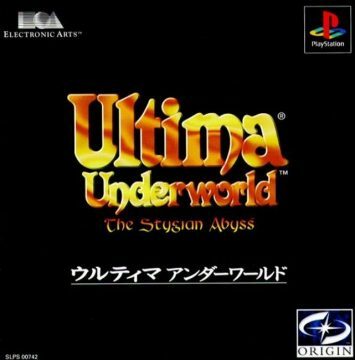 This early build of Underworld was demonstrated at the 1990 CES show, where Origin Systems saw the game for the first time and were, in Spector’s words, “totally floored by it”. Origin agreed to publish the game and suggested reworking it to fit into the Ultima universe. The team quickly expanded with an infusion of Origin employees as well as much-loved freelance composer George “The Fat Man” Sanger on sound and music, and began massive time-crunch work to finish the game, with Warren Spector managing the team to keep everyone from going too crazy. Bug-testing was done by MIT friends of the development team, and it was finally released in March 1992, close two years after work began. Though he wasn’t the most important person on the team by far, Ultima Underworld is notable for launching the real career of Warren Spector. 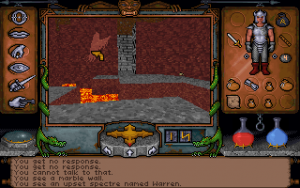 If UU is Paul Neurath’s baby, then System Shock, a game using Underworld’s engine and developed by Blue Sky successor Looking Glass Studios, is Warren’s. 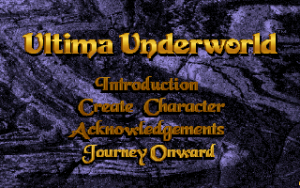 The basic Ultima Underworldconceit, that of blending an action game with a role-playing game and a simulation all in one and emphasizing non-linearity and player choice came together again in System Shock, and with the success of both the Ultima Underworld games and System Shock, Spector would continue to push and develop this particular variety of game into ever-increasing heights and massive critical acclaim for years at the head of numerous development teams. Eidos Montreal’s Deus Ex: Human Revolution and 2K Boston’s Bioshock are both direct sequels to Warren Spector games and are both, ultimately, based on Ultima Underworld; the series is clearly still with us. 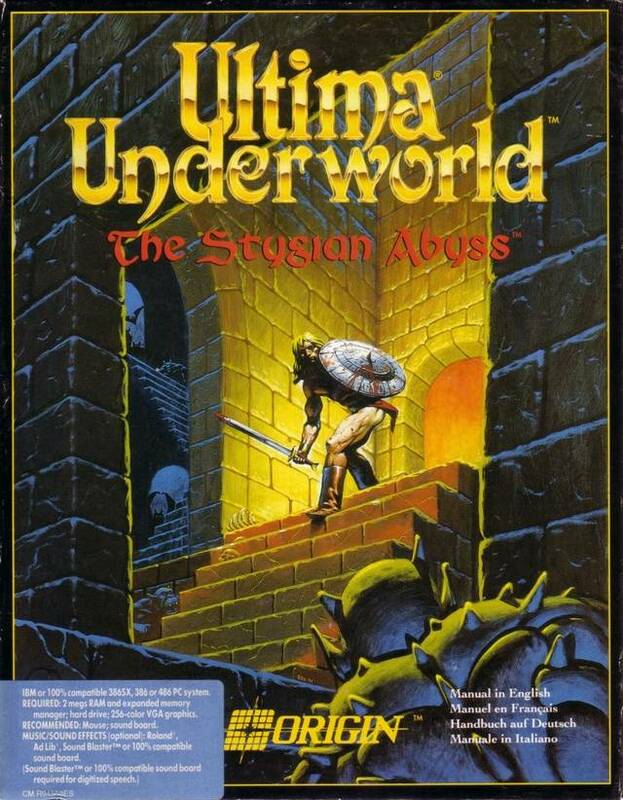 Ultima Underworld: The Stygian Abyss was originally published for IBM PC in 1992. 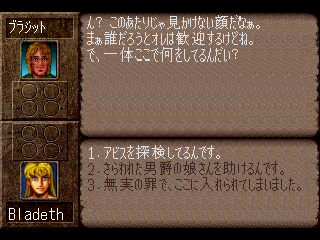 Japanese ports for the FM Towns and PC-98 by Electronic Arts Victor followed the next year; these ports, other than the text, are identical to the English PC version. 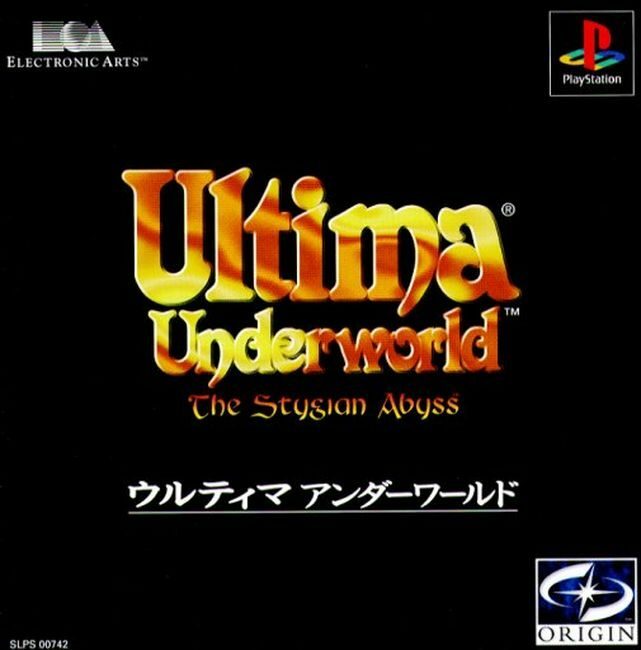 Five years after the game’s original release, Electronic Arts Victor, a publishing company cooperatively owned by Electronic Arts and JVC, released a Japan-only Playstation remake of The Stygian Abyss. 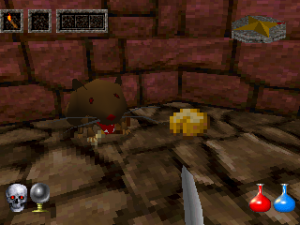 The game was looking quite dated by 1997, so the PlayStation port gives it a complete facelift: a much larger viewing area that takes up the whole screen, detailed, higher resolution textures, a full-motion video intro with full voice acting (in Japanese), and the cartoonish sprites have all been replaced with (rather ugly) 3D models. The game runs at a fast pace and looks and sounds fantastic, particularly the voice and sound effects; sadly the draw distance still isn’t very good. 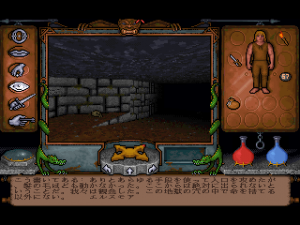 It compares very favorably to the flat, stutter-filled King’s Field games by From Software which are Ultima Underworld‘s only real direct competition on the PlayStation, except for the matter of the controls. Ultima Underworld‘s controls do not map well to the Playstation controller, and the game is hideously awkward to play, even moreso than the non-mouselooking commands on the PC. Of course, the Avatar is also now an anime pretty-boy. There is no evidence that there were ever plans to release this version of the game in North America. In 2002, Paul Neurath’s company Floodgate Interactive (Dark Messiah of Might and Magic, Neverwinter Nights) collaborated with ZIO Interactive and Doug Church to port Ultima Underworld to Windows PocketPC, a variety of PDA. From videos of gameplay it seems to be mostly faithful to the PC original, if a bit choppy. If you can actually play PocketPC software, the game isn’t hard to find and is rather inexpensive on the aftermarket. Ultima Underworld Walkthrough, official patch and downloadable demo. 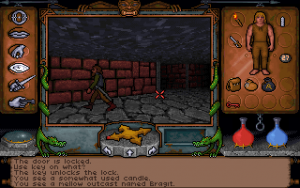 Interview about Ultima Underworld’s development with Paul Neurath. 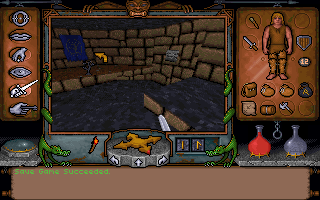 Sir Cabirus Dragon’s Ultima Underworld page; includes fan patch to play the game on Windows XP and other resources. 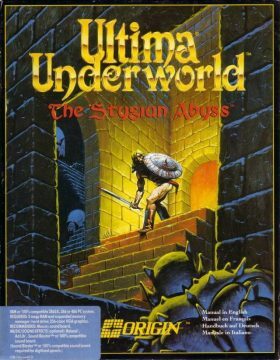 CVG ‘Games that changed the world’ entry for Ultima Underworld, including interview with Paul Neurath.